Yesterday evening, I attended a wide ranging meeting and I mentioned my concerns at the markings on this footpath when we were talking about small capital highways expenditures; invited by the meeting chair to send a picture, I followed up: "Following on from yesterday evening - here is a picture of the footpath from Melksham Oak school (capacity 1400 pupils) towards the town, which is the route that the majority school children who walk have to take. The road is the A365 - a major road with lots of cars and some heavy lorries too. We teach our children to follow / obey signs, and it is unfortunate to say the least (an accident waiting to happen?) that we're directing them if walking down a narrow band on the right (into the bushes!) or onto an 18" wide kerb between cycles and articulated trucks. I'm amazed that such a set of markings were put in just a few months ago - and I'm suggesting that a repaint / redesignation should be done here to put the two walkways together and thus mark up a decent footpath and a decent walkway before a group of children get killed. I raised this matter with the school when the Chamber of Commerce was shown around in July, and was told that it's nothing to do with them as it's off the school site - it's up to Wiltshire Council." This is of course part of the newly constructed links to Melksham Oaks School. Whilst this is not my project I did observe the Stage 3 road safety audit so I have pretty good idea of what •s gone on. From reading Mr Ellis • email I think he is perhaps a little confused about what the markings actually mean and how this area is supposed to work. Firstly the path is not segregated and remains shared use, although I accept the cycle symbols on its own perhaps give the impression that it •s for cyclists only. The area to the right of the dashed white line is not a narrow walkway; it merely delineates the edge of the shared use path and works in conjunction with the buff coloured areas to highlight the adjoining private driveways. The markings here are an attempt to encourage both cyclists and pedestrians away from the adjacent vehicle accesses. The photo would indicate that it •s actually working. The markings are particularly important for vehicles emerging from the private accesses as it helps direct cyclists into the centre of the path and avoids them running too close. It was envisaged this would help reduce the likelihood of conflict. It also improves the visibility for drivers emerging to any approaching cyclist or pedestrian. The author is completely correct (and somewhat kind). 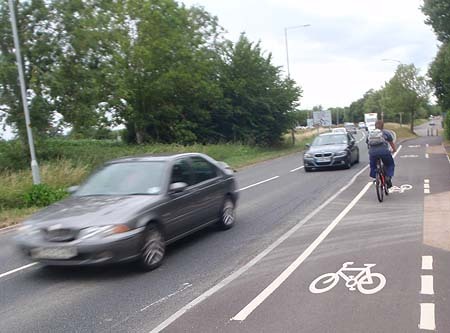 I'm not just confused - I hadn't understood AT ALL that a picture of a cycle in white in this way indicates that cyclists may use the marked section in addition to people on foot, who are (I stand corrected) also allowed to use it. But, alas, this doesn't entirely remove my concerns; I suspect I'm not the only one who looks at the signage and feels that the signals it gives are not the signals it means to give. That - as it stands - some cyclists (as the chap in the picture) will feel the centre's their right of way to go whizzing through at speed, with pedestrians giving way to them. And some pedestrians will feel they're encroaching onto the cyclist's territory. The suggestion of adding a pedestrian symbol alongside the cycle one seems - to my initial, none-expert eye - a sensible one; to me it will say that this is the safe zone for both cycles and pedestrians. That cycles should take care extra care because they're on a shared area. That pedestrians shouldn't have to move out of the way to an unsafe zone as a cycle approaches. I hope to be able to report a change in the marking ... and to be able to do so before I ever have to report on an accident caused by the current markings which we agree are "a little confusing"
"I only passed it your way as it will be raised as an issue at the Community Area Transport Group at the beginning of next month and if it has been the subject of a safety audit and meets current guidance then we should be in a position to deflect any criticism and explain why there is no need to make any changes." What does our MP do on a Bank Holiday?